Jonker Street, also known as Jalan Hang Jebat, is probably the most well-known street in Melaka. This is the heart of Chinatown and home ground to antique and souvenir shops. On weekend nights - Friday, Saturday and Sunday, the road is close to traffic and street stalls (aka Pasar Malam) are set up. The entrance of Jonker Street / Walk, is pretty prominent with the San Su Gong 三叔公, the famous local products store. 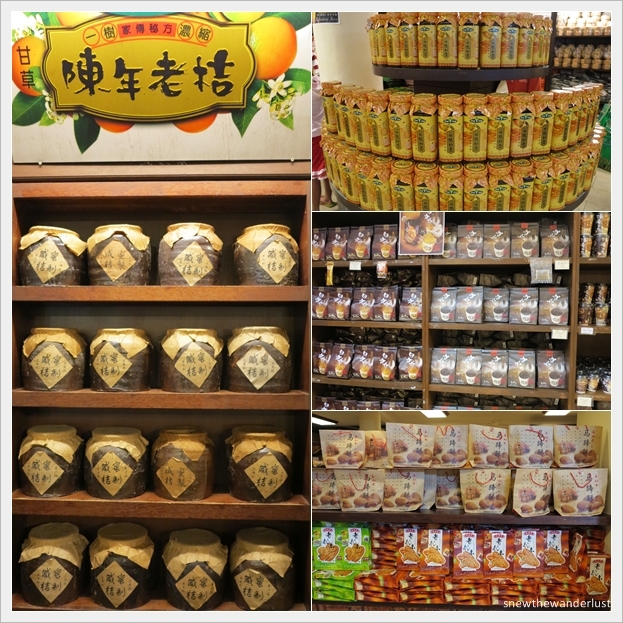 Some of the popular goodies include the lime juice, Beh-Teh-Su (马蹄酥) and white coffee. On the first night that we visited Jonker Street, it was a Saturday night. 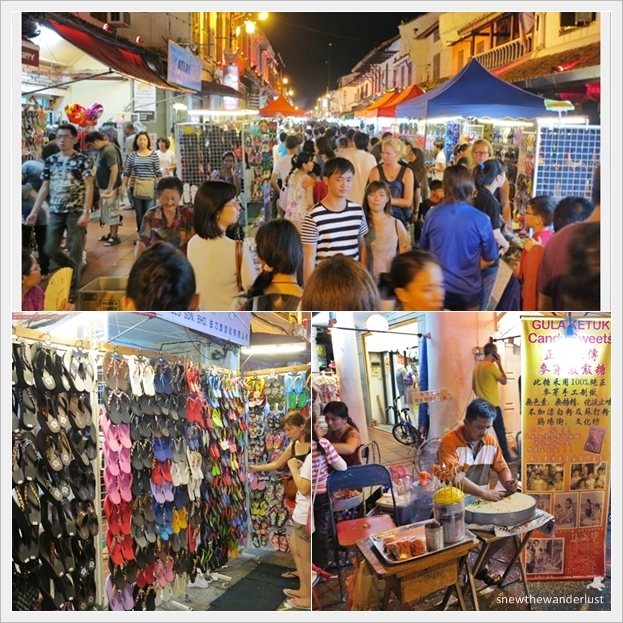 Jonker Street was packed with visitors, particularly San Shu Gong, packed with tourists both shopping inside, or waiting for the others, outside. Lao Qian Ice Cafe is located within San Shu Gong. On the busy Saturday night, we overheard someone queued over one hour for the Durian Chendol. I'm not sure if it was correct, but for us, we didn't queue long for that, though we have difficulty finding an empty seat in the store. Cost about RM5.80, it's worth a try. You can really taste the durian in it. But of course, I won't queue over 1hour, if that's what I heard correctly. We only queued for like 5 minutes? but it was close to closing time. The next shop on the stretch is famous Hoe Kee Chicken Rice. Hoe Kee Chicken rice is next to San Shu Gong as you walk further in on Jonker Street. 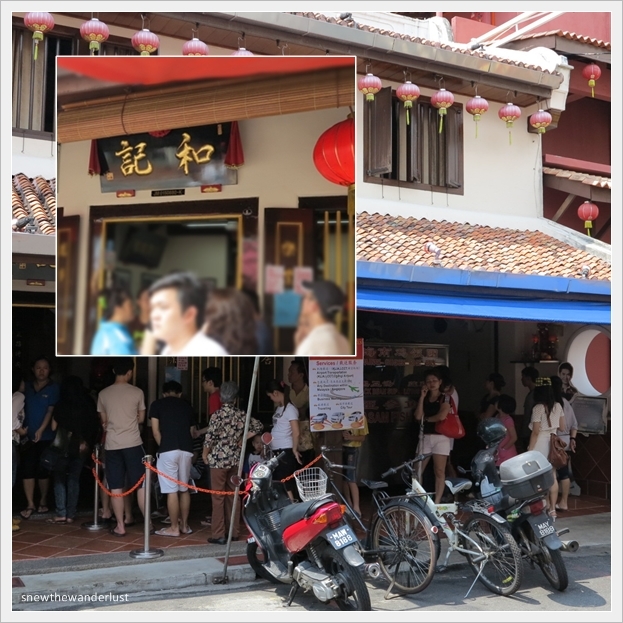 From the blogs, this is one of the "must try" chicken rice shop. The queue was pretty long when I visited before 2pm on a weekday. We gave up queueing, but that's also because we already had lunch, and this was like our round two originally planned. Someone told us that chicken rice wasn't that nice compared to Singapore, hence, we didn't have much motivation to continue queueing. Do let me know your thoughts if you have tried. Do not confuse Chung Wah chicken rice, which is opposite San Shu Gong, to Hoe Kee. This is the corner coffeeshop on the right hand side, as you pass the river leading to Jonker street, . The shop wasn't open on the past few days we were at Jonker Street. Finally, I saw this open on our last day, with a horrendously long queue. The picture at of this queue was taken about 2+pm, and still there's such a queue line. Papa Snew remembered trying this a couple of years back and didn't really like it. I can't really recall. But it can't be that bad with such a long queue. I was told that the chicken rice ball here is the best. Both of these chicken rice shops are open only during lunch time and serve till it's sold out. I'm really not sure of the operating hours and the days of operation. If you know, do drop us a comment. The speciality about the chicken rice in Melaka, is the rice, that is knitted into a ball. Some people like it, others prefer the usual plate of chicken rice. We have this debate with my group of friends over chicken rice in Melaka vs the Singapore chicken rice. Many felt that the smoothness and silkiness of the chicken in Singapore making it tender, is still a taste that many of us prefer. The chicken used in Singapore, are breed in captivity, whereas those in Malaysia, are usually "kampong" chicken, which is tougher. Some prefers the smooth and tenderness, where others prefer the tougher version of the Kampong chicken. Which is your preference? Leave us your comments. My group of friends are all raving that they need to try the chendol in Jonker 88. We went on the first night - Saturday night, but the shop was close. We were pretty disappointed, and went back on Monday, after lunch at Ole Sayang. This is perhaps, the most popular Chendol in Melaka. You would probably not been to Jonker Street if you have not tried the Chendol here. Look at the crowd. We were a party of 7, and took us some time to get a table, big enough to squeeze all of us in. The walls are decorated with old notes, uncut from different countries, including Canadian. No wonder someone call it Museum Cafe. Well, after squeezing through a small door and waiting for a table, you also have to queue for food. It's self-service, so you have to carry the bowls of Chendol to your own table. You have to queue separately for Laksa. One of our friends try the Assam Laksa. Looks at the spoonful of tuna! Taste sourish instead of spicy. But I probably have to taste the Penang Assam Laksa to compare before commenting. A peep at how the Chendol is being prepared on my way out. I didn't know there were different types of Laksa and Chendol that you could order from, till I was leaving and saw the menu signage. Alright, I will return next time to try the different types of Laksa and Chendol. Look at the busy night market on a Saturday night. Stalls selling souvenirs, handphone accessories, slippers, and shops selling nice Tees are the most common. Street foods are the most common. It's durian season. But the durians sold at Jonker Street is not cheap. I can't remember the price though. 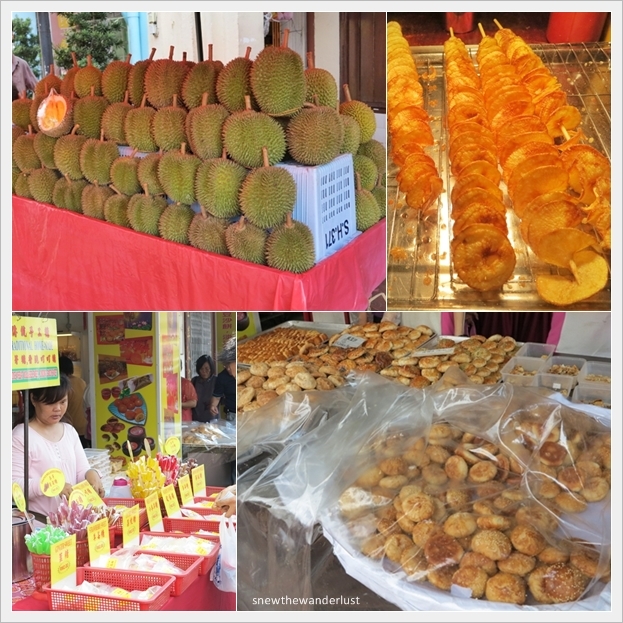 Snacks like potato chips, candy sweets, Kuik Kuik are common too.